Creation: Created July 1933 running from the Warwick River in Denbigh east to US 17 north of Tabb (replacing VA 517); duplex with US 17 north to Harris Grove north of today's VA 105; east through Seaford to end at Back Creek waterfron near its outlet (replacing VA 528). This has been the only VA 173. 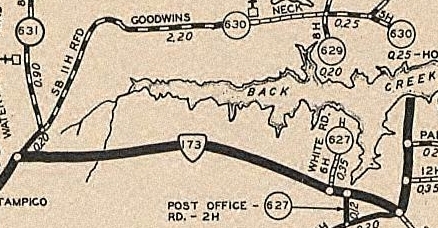 Adjustments: In Aug 1954 (CTB), VA 173 was rerouted at Hornsbyville to proceed to Dandy as it does now. 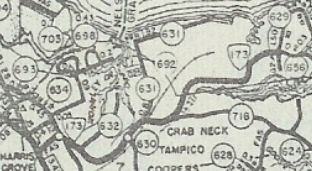 The old route through Seaford over to Back Creek became SR 718. 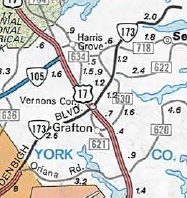 Around 1975, VA 173 was rerouted away from Harris Grove and instead followed SR 622 from Hornsbyville to its current junction with US 17. 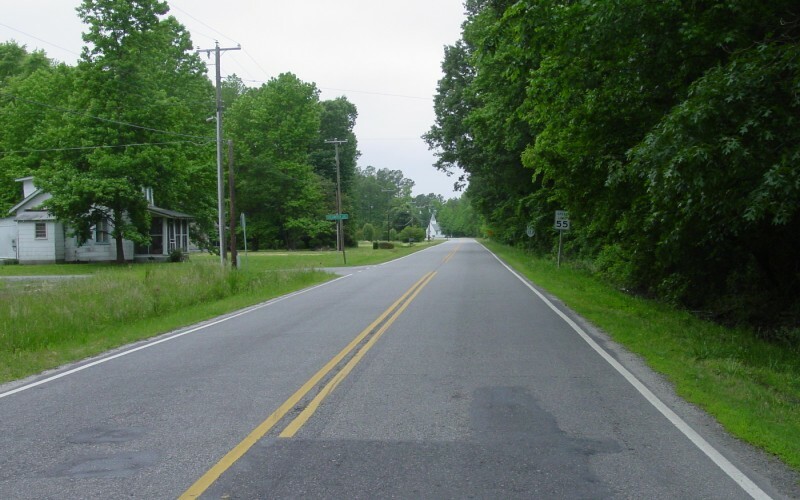 The old part of VA 173 became more SR 718. 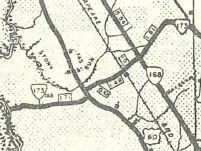 Also around 1975, VA 173 was straightened out where it crosses US 60, which moved from Old Courthouse Way to Warwick Blvd. VA 173 had a duplex with US 60 until this point, as well as using Hoopes Rd and Oriana Rd. 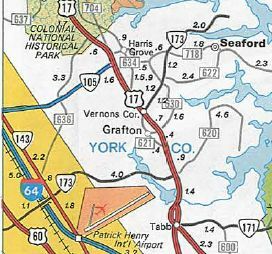 In Feb 1979 (CTB), VA 173 was rerouted to eliminate the US 17 duplex and assume its current York County routing. The new routing was new construction and the old routing became SR 620 Oriana Rd. VA 173's first multilaning was its US 17 duplex in 1965. 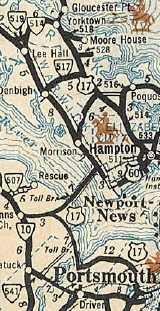 VA 173 was multilaned from VA 143 to SR 620 in 1978. No other multilane segments are shown on VDOT Officials but I know it has been multilaned from US 60 to VA 143 back to at least 1991. Posting: Fully posted, though poorly west of US 60. Other names: Denbigh Blvd (west of US 17); Goodwin Neck Rd (east of US 17). Comments: Denbigh was the county seat of Warwick County before Newport News came along. VA 173 west of US 60 could be decommissioned...serves no purpose whatsoever.